Rek'Sai is a high pressure early game jungler with the potential to have global presence and a sonar sense that makes counterjungling her difficult. She has high base damages, but falls off as the game goes on and teams begin to group against her, still her ultimate allows her to maintain higher levels of objective control as the game progresses. 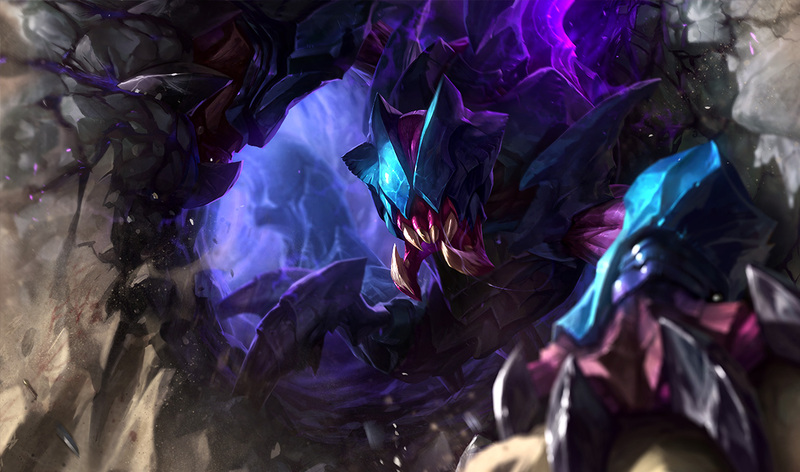 Rek'Sai generates 5 Fury every time she lands a basic attack and 10 Fury every time she lands Queen's Wrath, Unburrow or Furious Bite, plus 2.5 additional Fury per enemy hit beyond the first. Rek'Sai loses 20 Fury per second if she has not gained any in the last 5 seconds. As long as Rek'Sai remains burrowed, she expends 20% of her accumulated Fury every second to heal herself.This stops once Rek'Sai consumes all of her Fury or returns to full health. UNBURROWED - Rek'Sai's next three basic attacks within 5 seconds deal bonus physical damage to her target and all surrounding enemies. Queen's Wrath resets Rek'Sai's autoattack timer. 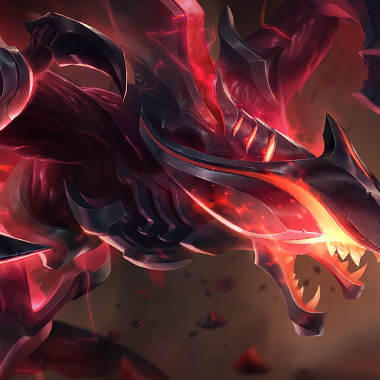 BURROWED - Rek'Sai fires a void-charged pulse in a target direction that detonates on the first enemy struck, dealing magic damage to all enemies in the area and Sight icon revealing them for 2.5 seconds. 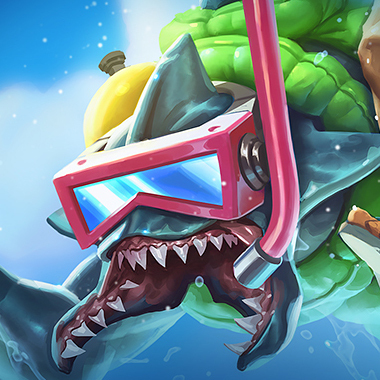 UNBORROWED - Rek'Sai burrows into the ground, reducing her sight range and disabling her basic attacks while gaining 15 / 20 / 25 / 30 bonus movement speed, immunity to unit collision, access to an alternate set of basic abilities and Tremor Sense. With Tremor Sense activated, enemy and neutral units that move near Rek'Sai have their position revealed to her and her allies every 1.5 seconds. This does not grant Sight icon sight, but can be seen through Fog of War. Unburrow: BORROWED - Rek'Sai bursts out of the ground, dealing physical damage to surrounding enemies and knocking them up for up to 1 second, based on their proximity to her upon emerging. Enemies cannot be affected again by Unburrow for a few seconds. 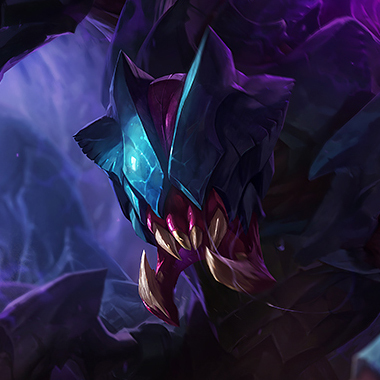 UNBORROWED - Rek'Sai bites the target enemy, dealing physical damage that is increased by 1% for every point of current Fury. If Rek'Sai has full Fury, Furious Bite deals true damage instead. Tunnel: BURROWED -Rek'Sai dashes in the direction of the cursor, leaving behind two connected tunnel entrances. She can interact with either entrance to traverse the tunnel again, but each tunnel shuts down for a few seconds after being used, momentarily preventing further traversal. Rek'Sai's tunnels last for up to 10 minutes and can have up to 8 pairs of tunnel entrances active on the map at the same time. Enemy champions can destroy a tunnel by standing on either entrance for 1.5 seconds. PASSIVE: Rek'Sai gains bonus attack speed. Upon reaching the edge of the map, striking an enemy champion, or upon the reactivation of Whirling Death, the axes slowly come to a stop before changing direction and returning to Draven, dealing the same physical damage to every enemy struck on the way back. Whirling Death deals 8% less damage for each unit hit, down to a minimum of 40%. This reduction resets when the axes' reverse direction. This one sounds simple, but people will always not do it for some reason. Do NOT leave her tunnels alive. Every Tunnel she has is more objective control for her team and possible counterganks for her. This is one of her most powerful tools, the ability to be anywhere on the map. Whatever you do, kill those tunnels. Against ranged champions, Rek'Sai is reliant on the Flash-Unborrow combo, if she doesn't have flash, she's not very strong against ranged champions with dashes and will find herself being kited and chunked at best. Do not attempt to counterjungle Rek'Sai, especially in the early game. Her Tremor Sense allows her to see when someone is in her jungle and she can easily hide out of sight and call for assistance from a laner when she senses your presence. If Rek'Sai builds a damage item after her jungle enchantment, she'll be really squishy. At this point your team can CC and kill her in any engagment, making teamfights a fast 4v5. Nidalee can kill her at level 2, then again when she has her Runic Echos, and really until Rek'Sai gets a sufficient amount of Magic Resist. 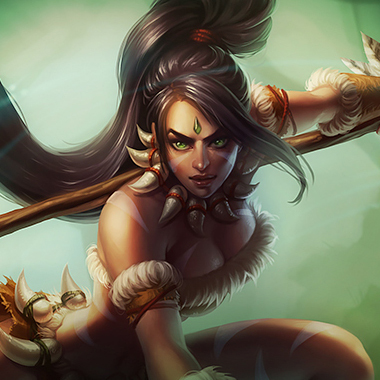 A Nidalee that can land her spears will win any 2v2 in a gank/countergank scenario up until the Rek'Sai has sufficient resistances. 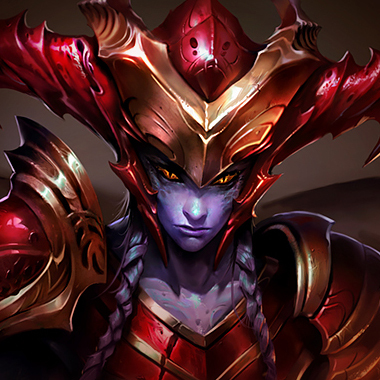 A Shyvana that takes Smite and Exhaust can win a one on one against Rek'Sai, but generally Shyvana will simply be more useful than Rek'Sai in teamfights, so she's a good pick for either aggressive or standard playstyles in this matchup. Elise will outdamage Rek'Sai if she lands her Cocoon, in every early game skirmish. and without flash, in melee range, it'll be hard for Rek'Sai to avoid the skillshot. Still, these champions are about equal in early game pressure, and both get less relevant stat-wise as the game goes on. Armor and pink wards. She does almost exclusively physical damage, and is a strong counterjungler. I recommend a sunfire cape to make fighting her more possible, and a Randuins Omen to keep it off of your backline or to stopher from running away. Wards are the most important part, thanks to her ability to counterjungle really well. If you can catch her in your jungle and collapse, you can easily set her behind and destroy her ability to fight later thanks to how behind the curve she is.